Meet "Art," so named because he's no ordinary pig. He's an art pig. You can tell from those cool polka dots. He's also a good listener. He's interested in everything. I've been interested in softies since I first saw the book "Stupid Sock Creatures" by John Murphy. His website is fantastic too. You might also like the magazine "Stuffed" by Stampington. To see more books about making lovable creatures from socks, gloves, and old sweaters, click here. The day after Thanksgiving is Gingerbread Day for our family and our friends the Murphys. Growing up, my two sisters and brother and I were best friends with the three Murphy girls who lived next door. We played together, shared clothes, had sleep-overs, rode the school bus, went to Girl Scouts, church choir; we even went on vacation together. When we started having children about 27 years ago, we began a tradition of getting together the day after Thanksgiving to make gingerbread houses. We do this every year. My sister Eileen makes all the gingerbread pieces and the frosting that we use to construct the houses and attach the candy. Everybody brings tons of candy. I like the pretzel trim on the house below. As you can imagine there were some pretty big messes over the years, but we're past that now. None of the kids have "outgrown" gingerbread day. My niece Amelia is the youngest of the group (on the far right). You can see half the table below. There are over 20 of us! Our son Brian made his version of the Parthenon below. Eileen's son Nate added a waterslide to his gingerbread house. Last year somebody made a silo to go with their house. My DH and my sisters' DHs say that soon after marrying us they realized that they had also married into the Murphy family. Haha. I'm so glad that Eileen goes to all the trouble of making this event happen for all of us. And you know she's a quilter, right? Have you ever felt a little disappointed that Betsy Ross got to design our flag and not you? Well I know how you feel. 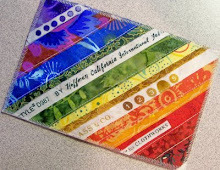 So for the January 2011 Block of the Month for Empire Quilters we'll be making our own flags. Shown here are my first two flag blocks. They measure 12" high by 15" wide. (In the finished quilt, the flags will measure 11.5" x 14.5.") Click the link for more info. 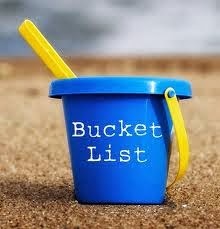 If this idea appeals to you, help yourself. If your guild makes a bunch of blocks, please send me some photos. 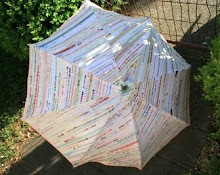 I think this BOM will make a gorgeous quilt, don't you? 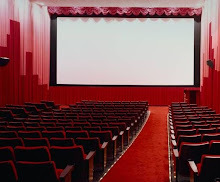 Last Sunday my DH and I saw the movie "Red" in Winsted, CT. We didn't have to wait in any long lines and we weren't bothered by people talking during the movie. It was just us! Before the movie started, I got up and took this pic to show you. That's my DH you see there. It wasn't like this when we lived in New York! Yes, I did put my feet up. I'm not a fan of action movies, but I enjoyed this spoof. It starred Bruce Willis and Morgan Freeman. Retired CIA agents get together to do a mission. No gore, and the good guys win. I saw this standard size sink with two faucets recently at Whole Foods or Barnes and Noble. I can't remember which. Have you ever seen such a thing? Must be the work of some over-achieving plumber! Daryl in New Mexico of the Patchouli Moon Studio blog just made this zippered selvage bag. It's as big as a tote bag and she plans to carry her knitting project in it. Since she'll carry it as a clutch, it doesn't have a handle. I think she just wants to hug her selvages and her knitting. Makes sense to me! 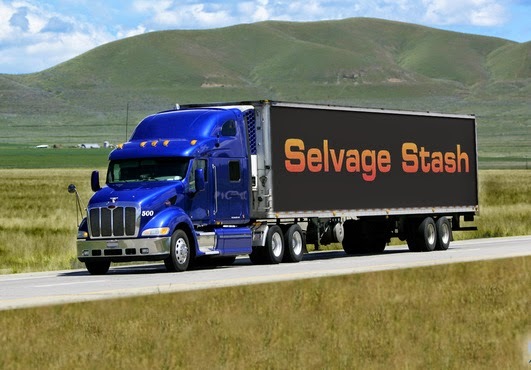 She says it hardly made a dent in her selvage supply. I see some selvages in there that Daryl won from the Selvage Blog! The row of green dots looks awesome, doesn't it? Great job! I love this holiday because it's focused on thanking God for our many blessings. All morning the baking turkey and pies smell so wonderful. At the table we take turns telling what we're thankful for. Finally we go for a walk. Tomorrow we'll make gingerbread houses with our friends and move right in to Christmas festivities. My husband and I listen to Christmas music all year long, so that doesn't change. Haha. Have a wonderful day! "Freedom from Want" by Norman Rockwell shown above. This block is from Amelia in Vermont. Now this is a cheerful block. Lotsa love in blogland. This elegant Celtic Hearts block was made by Marky in Wisconsin. She says it represents how we are all tied together with love and concern in spite of the physical distances separating us. 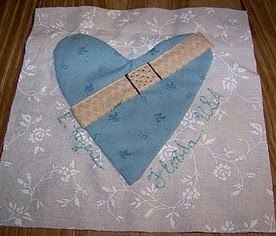 Elizabeth from Florida had a great idea when she put a bandaid on this nice blue heart. 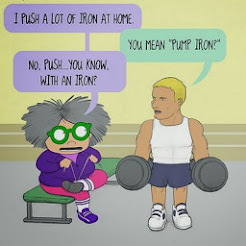 It makes me chuckle and I think Myra will too. Elizabeth's blog is Sand and Sunshine. 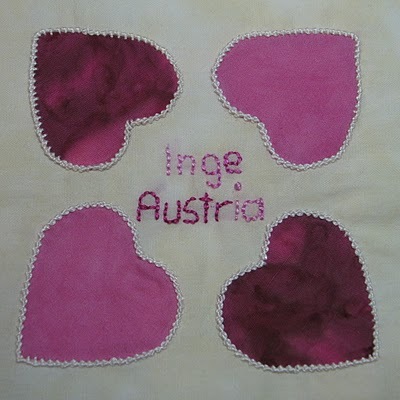 Quilters in Austria have been busy sewing heart blocks for Myra. Here is the latest one, from Inge, a friend of Ursula. 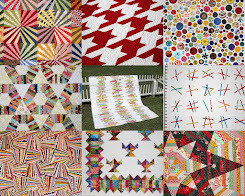 What a kind-hearted neighborhood of quilters we have in blogland! If you'd like to make a block, click on the blue link button in the sidebar. Linda from Iowa (and the Flourishing Palms blog) sent me this photo of a selvage misprint. At first glance you might guess that it was a Bostonian using his phonics skills to spell "Garden," but then the whole name would be "Gaden Paddy," so that can't be it. Haha. Thanks, Linda. A friend once told me that she and her husband were not up for pizza and beer because they were watching their "cobbs." Wha? You know, short for carbohydrates. Well duh. Congratulations to the 3 winners of Quiltmaker's "100 Blocks:"
Ulinkap in Poland. Szycie Uli. Judi in Virginia, Karate Quilter. Anya in Pennsylvania, Hills Creek Quilter. 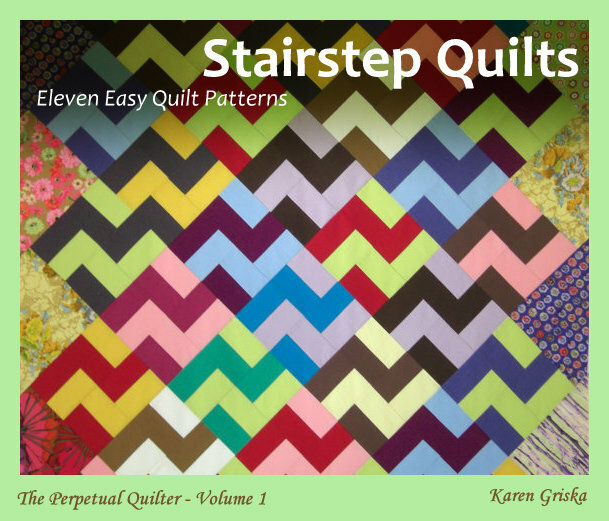 More giveaways of beautiful quilting books coming soon. So stay tuned. 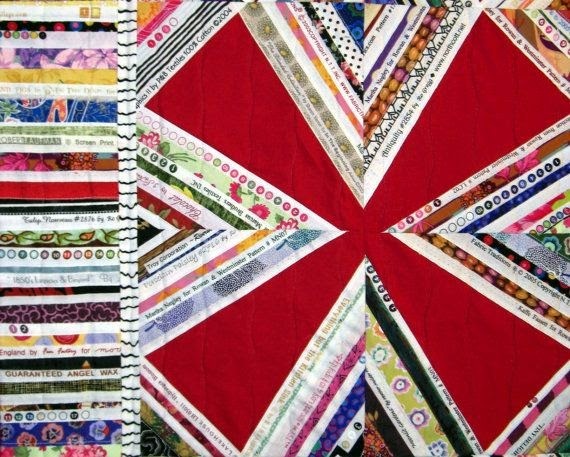 I just finished my block for the blogland challenge by Beth at Love Laugh Quilt. You have until Jan. 1 to submit a block. But why wait? 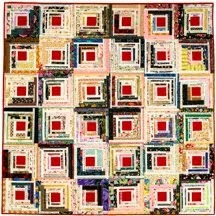 Several winners will receive a collection of blocks for a blogland quilt. My favorite part of this block is the big branch above the house in the night sky. I would use that same fabric for the sky on each side of the house if I had it to do over. That hot pink fabric was supposed to look like a sunset, but it looks more like a forest fire! Take a look at Nifty Quilts. She has the most stunning Harvest Baskets quilt there today. It's a center medallion made from solids and plaid fabric. Nice job! This light and airy selvage quilt top is the creation of Jodi Nelson in Oregon, of the Pleasant Home blog. I really like this one. The selvages are close together so there is lots of white. 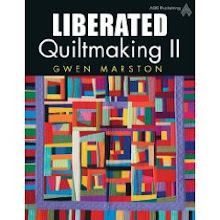 Thank you to Vicki in Australia who gave me the heads up about this quilt. Isn't this selvage bag stunning? It was made by Flossy Blossy in the UK. (Not to be confused with Flossie Blossoms.) She has a very interesting blog. Nice job, Flossy! To see the post about this bag, click here. 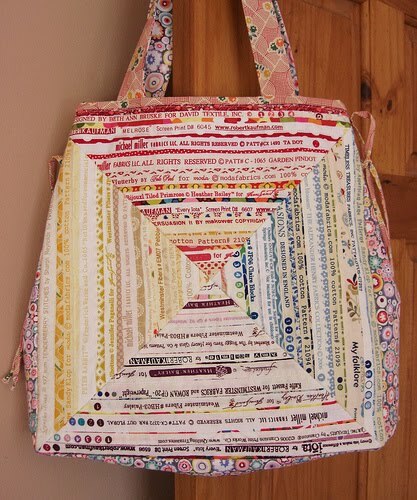 She was inspired to make this bag when she saw the selvage frock made by selvage genius Jodie Carleton of Ballarat, Australia. 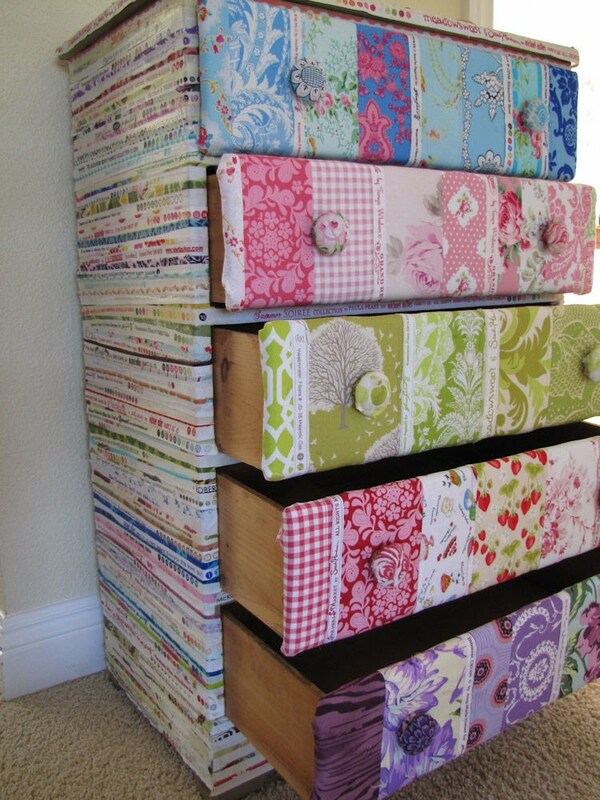 Can you believe this awesome selvage-covered chest of drawers?? It was made by Monique from California. Her blog is called Sew Fun by Monique. What beautiful fabrics! Yayyy, Monique! She says she got the idea for this project while she was in the shower. I get good ideas in the shower too. Where do you get good ideas? 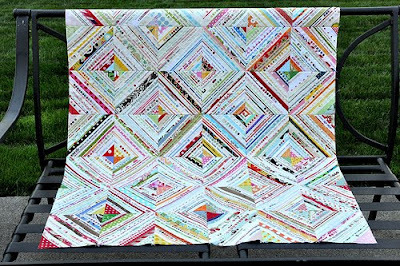 Beth at the Love Laugh Quilt blog is celebrating the good friendships that we quilters enjoy in blogland by generating a neighborhood of quilt blocks. I like hers, don't you? The little finial on the roof and the red door are perfect! Here's the general idea, but click on over to her blog for the full story. We each make a 12" square house block (any kind of house). Sign your name on the block. Include your blog name if you have one. Mail it to Beth before January 1st. She'll choose the winners who will receive about 12 house blocks to make a blogland quilt. Leave her a comment today if you're "in." I'm "in." I might make a house with selvages like Barb's charming Whooville houses. Today I made my heart block for Myra in NZ. I chose a blue print because there haven't been any blue blocks yet, that I know of. Click on the link in the sidebar for the details if you want to make a block. I like how the little white beads add some sparkle. My name and "USA" is embroidered with thin blue thread. The block shown below was made by Daryl in New Mexico. Check out the deatils on her blog: Patchouli Moon Studio. 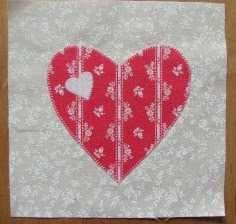 Another of Martina's friends, Petra in Germany made the courthouse steps style heart block. Visit Petra's blog. She likes knitting and traveling too. Okay, back to regular business tomorrow! This was fun. If you make a block, email a photo and I'll post them all at once next week. Yesterday Martina (in Germany) told me about three of her quilting friends in Austria who have also made blocks for Myra (in New Zealand). The beaded heart above was made by Claudia. See Claudia's Blog. Update: Karen Jones, Myra's friend and the one who started this project, said that Myra received this block already. She was surprised and overwhelmed. 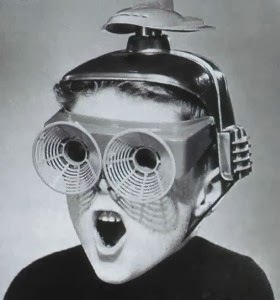 She doesn't know what 's going on here in blogland. This is a big neighborhood! 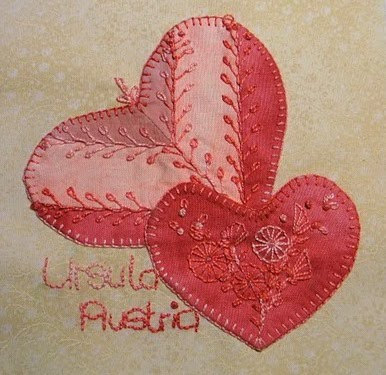 This hand embroidered crazy heart block was made by Ursula. Read more about it on her blog: Ursula's Kreativnest. So elegant. The striped heart below was made by Hanna. Take a look at Hanna's Quilt Page. She's been busy so you'll have to scroll down a bit. 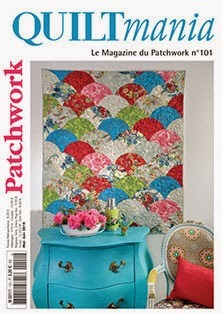 Great quilt show photos. 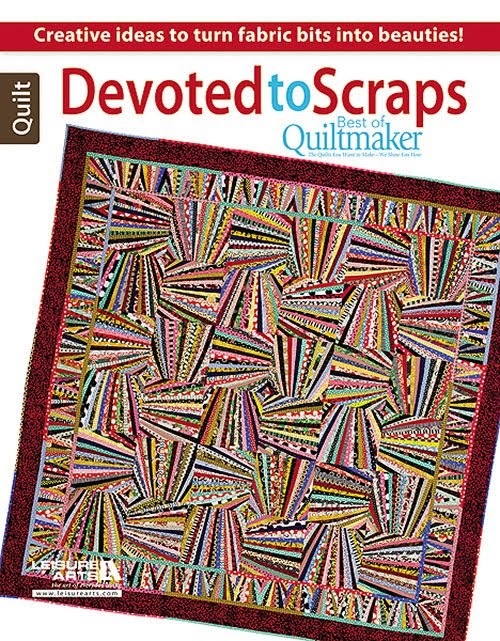 Are quilters tender-hearted or what? More book giveaways coming soon. 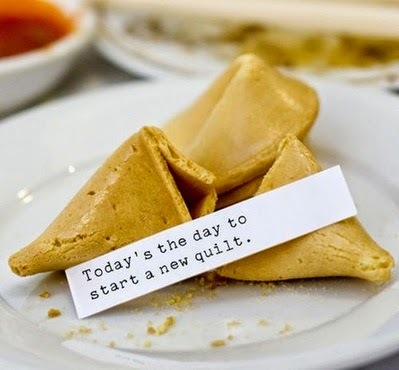 Have a very quilty day! This block was made by my friend Martina in Germany. 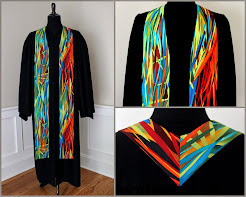 I like how she combines selvages with embroidery. Take a look at Martina's blog and be sure to see her new spider web quilt. 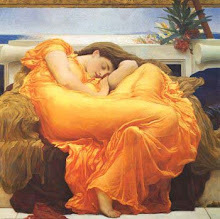 Beth from California was also quick to respond to the call for some quilty love in cyberspace. 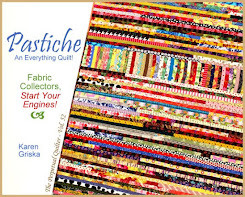 She's got lots of interesting things to see on her blog: Love, Laugh, Quilt. Yayy, another heart with selvages. 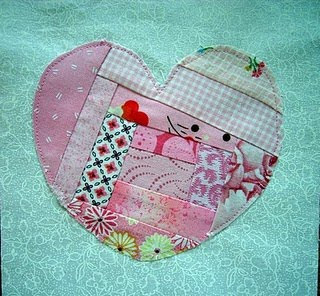 Michelle in Florida of the Nostalgic Cafe blog made this pretty log cabin style heart block. Very nice! See her blog for the weirdest Halloween fabric! and a selvage Christmas tree decoration too. I think Myra will be delighted with these blocks, don't you? I still have to make mine. 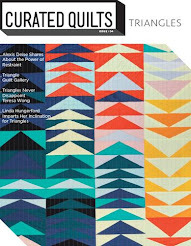 The new collector's edition of Quiltmaker's 100 Blocks, Volume 2 will hit the stores on Tuesday. Leave a comment below to enter a drawing for a free copy. There will be 3 winners. The block above is my contribution to this issue. 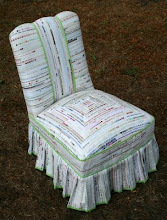 It's called "Upcycle" which means, of course, making something cool out of "throw-away" stuff. Selvage quilters can tell at a glance how to make this block, but to show the newbies, I took some in-process photos. Machine stitch along the bound edge of each selvage. The stitching is easy to see on the red selvage in the photo below. I like the little boots on the Moda selvage. That's one of my favorites. Trim the block as shown above. Make three more, then sew them together, as shown below. Add a selvage to the top and the bottom of the block, and then add one to each side. I think it will look really interesing when all the blocks go together. The long selvages will appear as if they're woven together. So far, I've only made one block, so this is just speculation. I like the soft shaggies on the Moda acorn selvage below. I was delighted to see another block in this book that included a selvage. Patty Young designed both the fabric and the block design for "Flutter." Isn't the hummingbird shape nice? Great colors too. Okay, here they are, ready to be mailed to three lucky winners who will be chosen by our friend Mr. Random Number Guy. So leave a comment. Wasn't it interesting to read about what we quilters wear (or don't wear) on our little feet when we sit down at the sewing machine? Who knew? This is Post Number 1,000!